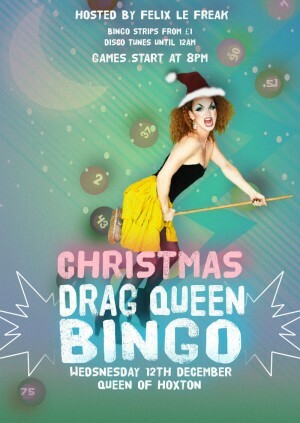 Wednesdays at Queen of Hoxton welcome DRAG BINGO! - a night of balls, wigs and satanic (Santanic?) invocation like nothing you've ever seen before! Bingo tickets are £1 and there will be plenty more on the night and from 8pm with eyes down for the first round at 8.30pm sharp! So make your hump-day count! You could be in with a chance of winning some genuinely underwhelming prizes - or even our top CASH PRIZE!